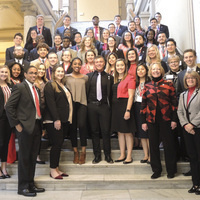 USI students and alumni are invited to attend a day at the Indiana Statehouse to meet legislators and tour the capitol building. This day provides an educational experience about the legislative process in the State of Indiana and how that process impacts the University. The 2018 NCAA Division II National Championship USI softball team will be recognized by the Indiana House of Representatives and the Indiana Senate with a Resolution on this same day.